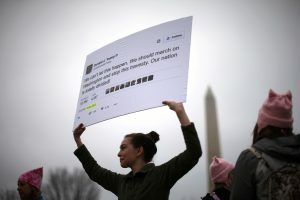 WASHINGTON — The National Archives and Records Administration has told the White House to keep each of President Donald Trump’s tweets, even those he deletes or corrects, and the White House has agreed. The head of the archives, David S. Ferriero, told two Democratic senators in a letter last week that the White House has assured him it’s saving all Trump’s Twitter blasts. The archives contacted the White House about the matter because the Presidential Records Act requires such correspondence to be preserved for history. Ferriero did not say when the agency contacted White House officials to remind them about the records requirement, but officials briefed the White House counsel’s office about the law on Feb. 2, according to the archivist’s letter to Sens. Claire McCaskill of Missouri and Tom Carper of Delaware. The archivist’s letter, dated March 30, doesn’t describe precisely how the White House is saving Trump’s tweets. The Obama administration used an automated system to keep copies of President Barack Obama’s tweets. McCaskill and Carper raised the issue of Trump’s tweets in early March following a spate of instances in which Trump had deleted or altered earlier tweets. The two senators had previously raised concerns about Trump’s tweets in a letter to White House counsel Don McGahn. The two senators also pressed the archives for information about reports that some White House staffers had been ordered to avoid emails or use smartphone apps that do not preserve emails because of Trump administration concerns about leaks to the media. Ferriero told them he was aware of those press reports but said that White House guidance “to all employees expressly forbids the use of such apps.” Ferriero also said he was not aware of government officials who have been instructed to avoid using email as a method of work-related communication. Trump’s almost-daily use of his official White House Twitter account and his separate private Twitter account has been heavily scrutinized by the media and by political friends and foes since his November election and even more so since his inauguration. Three minutes before he took the oath of office in January, Trump tweeted from his private account that he was “honered to serve you, the great American people, as your 45th President of the United States.” The misspelled word in the tweet was later altered to “honored” and then the tweet was deleted entirely. Unlike the archives’ clear guidance on saving Trump’s tweets, the agency has not provided any guidance to government agencies about preserving communications to and from Trump’s smartphones and agencies have not requested guidance, Ferriero said. The two senators raised concerns with Defense Secretary Jim Mattis about whether communications from Trump’s old smartphone were being preserved. Trump reportedly replaced his old unsecured Android smartphone with a secured iPhone but continued using the unsecured phone for tweeting through late March. The senators had also written to McGahn in February, asking about reports that at least four senior Trump White House officials “maintained active email accounts on a private email system.” Newsweek had reported in January that senior adviser and Trump son-in-law Jared Kushner, chief strategist Steve Bannon, counselor Kellyanne Conway and press secretary Sean Spicer all were using private email accounts on a Republican National Committee system. Trump repeatedly criticized Democratic president opponent Hillary Clinton for her extensive use of private emails when she was secretary of state in the Obama administration. The role of the archives, they added, is mostly advisory, but presidential records can only be disposed of after the White House consults the archivist in writing.